With time ticking (by now it was late May, we were departing the US July 1!) we realized that almost all of the options we were considering as our next stop after Tokyo required that we fly through Abu Dhabi and/or Dubai and switch to a regional carrier. Perfect – we now had a way to stall making a decision! We booked tickets on Etihad (thank you, American miles!) from Tokyo to Abu Dhabi and put off deciding where we would go next. The initial plan was to go in and out of Abu Dhabi, but the flight from Tokyo would arrive in the middle of the night, so we decided to give ourselves a day or two in Abu Dhabi. It turns out, though, that arriving in Abu Dhabi in the middle of the night on July 31 meant that we would be arriving during the low season (because no one else wants to be in Abu Dhabi in August! ), which in turn meant that all of the hotels were drastically reduced in price – often 1/3 the normal price. After a few searches on Kayak, we decided Abu Dhabi would be the perfect place to take a few days to catch up on work (since we wanted to be able to enjoy Seoul and Japan with Keith’s mom with only minimal work time), relax, and adjust to the time difference. A working vacation from our trip, so to speak. With all that as background, here are our tips for Abu Dhabi. We were only there a few days and it was 100 degrees (and up to 107!) what seemed like all the time, but we still managed to dip our toes into the culture and enjoy our first trip to the United Arab Emirates. Please be sure to check out our post on Dubai for more tips on the UAE. Getting around: In large part due to the heat, we limited our transportation to traveling by foot only when we needed to, taxis most of the time, and the hotel bus to visit the Sheikh Zayed Grand Mosque. Taxis were not as inexpensive compared to some of the places we’ve visited, but they were metered and clean. Uber was not available in Abu Dhabi when we visited, but you can use the Careem or AbuDhabiTaxi apps. As in so many other airports around the world, when you leave the Abu Dhabi Airport, you walk through a scrum of people offering rides, but if you keep going you’ll find a regular taxi line of silver or black vehicles that we were told charge much less than the people soliciting rides. The Abu Dhabi Airport is a long distance from the city (about 25 miles from our hotel), but (especially in the middle of the night) there aren’t a lot of other options. Reality check: It was so hot that the thought of even waiting for the bus seemed impossible, and one night at 10:00 p.m. we took a taxi a distance of less than a mile, just to avoid the heat! I can only imagine the reaction if you tried that in Chicago, but the driver in Abu Dhabi didn’t seem surprised at all, and his roughly 65 degree taxi was a welcome relief! Favorite experiences in Abu Dhabi: The city has so much to see and do, but with the work we needed to do (and interest in avoiding the heat where possible), we decided to forego many of the usual Abu Dhabi attractions for another visit. One of our favorite experiences was visiting the Sheikh Zayed Grand MosqueCenter. Check out our post on the topic. Finally, if you are staying at any of the newer hotels in Abu Dhabi, you’ll find that pools are common. In our case, our (somewhat older) hotel actually had two swimming pools, a nice gym, and a nice beach at their beach club across the road from the hotel. It was a great way to relax. Reality check: The Hilton Beach Club was full of people of all ages and sizes in miniscule swim suits. Most of the guests seemed to be locals/ex pats who were members of the Beach Club rather than staying at the hotel. The gym was large and well-equipped with a view of the largest pool, and I thought I was having the run of my life – running faster than I had in months. Then my fantasy came crashing down when I realized that the treadmill was giving me my pace in kilometers, rather than miles. Licking my wounds, I decided to try the weights. I had been one of only three women in the gym, out of probably 30 people working out there. In the weight area, I was the only woman, and after having to maneuver around a lot of very sweaty men, I eventually gave up and went to change into my swimsuit. While it went better than my experience changing on the dhow, it was more aerobic exercise than my run. 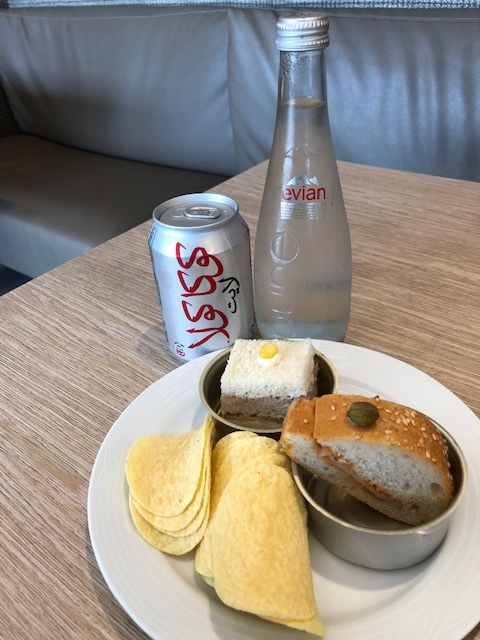 Meals: None of our meals in Abu Dhabi were particularly memorable, not because there isn’t great cuisine in Abu Dhabi, but because we were focused on work and weren’t excited to leave the air conditioned hotel any more than necessary. There weren’t many restaurants near our hotel beyond the 15 restaurants and bars in the hotel itself. (Not all of them seemed to be open during our stay, but you’d be hard-pressed to think of a cuisine not offered.) The Marina Mall was a 20 minute walk away, or you could take a (limited) hotel shuttle. The mall has several restaurants, including American chains like Shake Shack and a grocery store. The hotel’s executive lounge also provided many of our meals during our stay. Abu Dhabi is also a city where it seems as though every restaurant delivers, which we definitely utilized. Reality check: After hearing about the amazing malls in the UAE, the Marina Mall was a little surprising. There were several empty stores, and most of the restaurants seemed to be American chains. After weeks of only local food throughout South Korea and Japan, we caved and ate at the Shake Shack at the mall, which was actually a fair amount more expensive than the Shake Shack in Chicago. (Dinner for two was $40.) The Dubai malls were definitely more impressive than the Abu Dhabi mall we visited. Lodging: We stayed at the Abu Dhabi Hilton, which is on the Corniche Road and has great views of the Arabian Gulf. The price was just over 800 AED (or about $215 US) for three nights. Thanks to Hilton gold status, the time of year, and a very kind manager, we were upgraded to a huge room that included a kitchenette and had amazing views of the Arabian Gulf, and had access to the Executive Lounge. The lounge serves breakfast, has a sandwiches, soups, and other food at lunch, snacks throughout the day, and heavy appetizers and alcohol at happy hour. Over the course of our stay, meals and beverages in the lounge alone likely saved us far more than the cost of our room and allowed us to keep working and relaxing in the air conditioned cocoon of the Hilton as much as we wanted. The Hilton also offers reasonably priced excursions to the Abu Dhabi Falcon Hospital, the Grand Mosque, and the Louvre Abu Dhabi. Reality check: We appreciated the Executive Lounge at the Hilton, but some of the food was . . . interesting. (Croquettes that appeared to be filled with brie? A rude awakening for someone who has always believed all fried cheese is tasty!) The internet at the Hilton was also very good all but one hour of our stay – the hour we were trying to do a Facebook Live. Naturally! Overall: We didn’t go to Abu Dhabi expecting to see much beyond our laptops and our hotel room. Based on what we did see, I’d definitely go back during another time of year and hopefully be able to explore more. Have you been to Abu Dhabi? What did you think? What did you enjoy most?